Near the end of Marc Geiger’s amazing sermon at the European music conference MIDEM he made a comment about the differences between technologists and music industry execs face. This remains a big problem in the digital music world. Artists, music industry executives and technologists have been wary of each other’s motives. It’s been uncomfortable, and from time to time it can be downright contentious. I’m sure that music executives can reel off a greatest hits of outlandish and ridiculous asks from techies who just don’t understand how the music business works. And I have participated in some ‘colorful’ conversations about shortsighted label terms that only slowed down critically important progress. 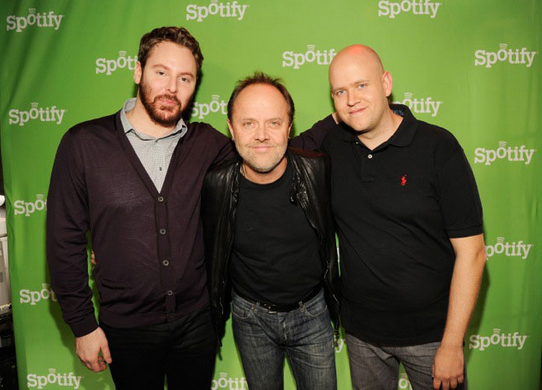 Can’t we get along: After Spotify signed Metallica to the service, Sean Parker, Lars Ullrich and Daniel Ek were all buddies. So I couldn’t agree more with Marc’s points, but it’s a two-way street. Both sides need to come together. What both the startups are trying to pull off (create new platforms of music consumption) and what the industry is in the middle of (rebuilding revenue from a product that no longer works) is hard. It will take both sides sitting down and understanding each other’s issues, motives and problems if we are going to deliver Marc’s vision. It’s very easy to get caught up in what the other side is doing wrong. What the music industry doesn’t always understand is that to find out what are the great products, we need to experiment. You never know what’s going to take off and quickly building products, iterating as quickly as possible to ‘fail fast’ requires more flexibility than what has traditionally been granted. What technologists need to understand is that music is just not a commodity to be packaged in a cool app. The music industry may have its faults and limitations, but it is still the best in the world at discovering and shaping great artists and understanding what is going to connect with the music fan. One area where both sides have been fairly unsuccessful is delivering what the music fan really wants in an experience. The industry might know the demand for artists and styles, but they sure couldn’t figure out how to deliver it. Let’s face it, none of the music formats have been really great, which is why we keep replacing them every decade or so. And asking your customers to replace their albums with 8-tracks, cassettes and then CDs while consistently upping the price has proven to be a horrible way to engender customer satisfaction. Part of why Napster hit its popularity in the first place was that there was such a bad taste in music fans’ mouths about having to spend so much money to only get the one song they liked on the radio. The first few generations of products have felt more like technical solutions designed by people who write code instead focusing on solving hard problems for the customer. Technologists have also fallen way short in their relationship with artists and management. I’ve heard stories of artists seeing demos of tools designed for them without the technology firms even talking to a single working artist or manager about what was needed. The techies started by trying to solve their own business problem instead of artists. Big problem. To start we need to get both parties together in a room. We need more events like Cash Music Summits that bring both technologists and artists together to discuss some of the thorniest problems and greatest opportunities facing the industry today. It’s a good start, but technologists need to do more than just talk. Getting artists involved in tasks like ideation, product definition, value propositions and even the customer lifecycle would go a long ways towards engendering goodwill and building a strong partnership. After all, if they’re great at making music, they might great at making music products. It bears mentioning that Beats Music’s chief creative officer is Trent Reznor. So what would working together look like? Well, a good example is the deal Twitter’s Head of Music Bob Moczydlowsky put together with Lyor Cohen’s new label, 300 Entertainment. Bob told Billboard Twitter will provide access to data that will help 300 decide who to sign to the label, a skill known as Artist & Repertoire. It used to be the A&R dude would spent 350 nights a year seeing potential acts to sign. But now data has become an important part of the job (along with going to see lots of music). Twitter understands that they don’t do A&R. But they know that they have amazing data that will help companies like 300. So Twitter partners with someone who really knows A&R and works with the company to provide solutions. Sounds like a pretty happy arrangement. I have spent hours describing in detail to more than a few tech execs why they shouldn’t get into A&R. It’s a amazingly specialized skill set that very few people at any streaming company know anything about. It’s also ridiculously expensive and the ROI doesn’t pencil out until you invest for years, and even then I couldn’t say with any certainty that it would return anything. Most likely they’d waste a ton of time and money and lose the focus on their mission, which was to build a killer music experience. In a thin margin business where you’re getting squeezed by aggressive suppliers and distributors, it becomes very tempting to try to ‘move up the value chain.’ But that’s a mistake. It’s like playing on a really great baseball team. Everyone needs to play their position. It doesn’t mean we can’t call out the shortstop for a lack of effort or tell the centerfielder they need better skills. That kind of feedback just makes everyone better. But if we understand our roles and respect what massively talented pros can bring to the table, we could build the all-star team that will be necessary to build Marc’s $100 billion behemoth. Dave Allen: Can Streaming Music Services Create a Bigger Recorded Music Industry?